Internationally known epigeneticist C. David Allis, Ph.D., will deliver the first Flexner Discovery Lecture of the academic year at 4 p.m. Thursday, Sept. 7, in room 208 Light Hall. 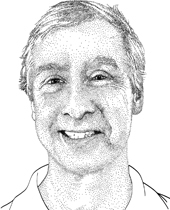 A member of the National Academy of Sciences, Allis is Tri-Institutional Professor of Chemical Biology, Joy and Jack Fishman Professor and head of the Laboratory of Chromatin Biology and Epigenetics at The Rockefeller University in New York City. After earning his Ph.D. in Biology at Indiana University in 1978, Allis undertook a postdoctoral fellowship at University of Rochester, New York. There, in the lab of Martin Gorovsky, Ph.D., he was exposed to chromatin, the DNA-histone protein complex that packages genetic information within the cell. But chromatin does more than that. By allowing or restricting access to specific genes, chromatin can regulate gene expression. In the 1990s, Allis and his colleagues identified opposing enzymes that add or subtract acetyl groups to and from histone proteins to enhance or repress the transcription of DNA into RNA copies. Histone modifications are potentially heritable, like DNA. Errors in the transmission of these modifications from one generation to the next have been associated with disorders ranging from birth defects to cancer. And in May Allis was received the 2017 March of Dimes Prize and Richard B. Johnston, Jr., MD Prize in Developmental Biology for his research, which also could lead to ways to prevent and treat premature birth and birth defects. Allis’ lecture is sponsored by the Department of Cell and Developmental Biology.